Mr. Brown was having dinner alone at Serangoon Nex’s MOS Burger when two young ladies approached him and passed him a paper bag. He opened it to find a cup of MOS Burger soup. On the bag was also a post-it note with a heartening quote that said: “People don’t care how much you know until they know how much you care”. Next to it was the now ubiquitous and very distinctive #loveothers14 sticker. 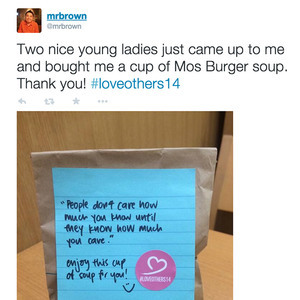 Mr. Brown was pleasantly surprised, and immediately took to social media to tell people about the kind act he had received. It really doesn’t take a lot to make somebody’s day!